Shrimp fishery by-product | HANG XANH INTERNATIONAL Co., Ltd. Protein quality of shrimp meal was found to be inferior to fish meal in rats, but supplementation with methionine and lysine improved performance (2)(CAB 20001408357)(Fanimo, 2000). Rats fed the oven dried shrimp meal were found to out perform the sun-dried shrimp meal (3)(CAB 19991411690)(Oduguwa, 1998). Shrimp meal was found to be a satisfactory supplemental protein source that could be used in feeding broilers (8)(AGRIS 82-748078)(Sapuay, 1981). Researches found that shrimp meal improved performance in broilers when replacing soybean meal (9)(AGRIS 1998-003740)(Rosenfeld, 1997). Only when shrimp meal replace 100 % of the fish meal in the diets fed to broilers was gain and feed conversion reduced (7)(CAB 971410693)(Fanimo, 1996). Shrimp meal was found to be comparable to fish meal and rat meal in feeding applications with broilers (12)(AGRIS 88-046580)(Aquino, 1985). 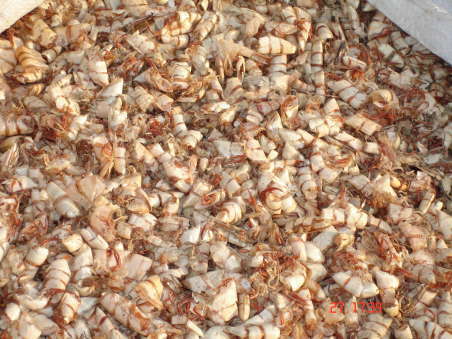 Broiler performance was reduced when 10 % shrimp meal was fed (13)(AGRIS 92-076742)(Raweewan, 1988). Shrimp meal was found to be an acceptable supplemental protein source for fish (Penaeus indicus) (1)(CAB 20001408154)(Manpal-Sridhar, 1999). Soybean meal could be replaced by shrimp meal in diets for fish (Penaeus vannamei) without depressing performance (4)(CAB 931463999)(Cruz-Suarez, 1993). Shrimp meal was found to be a suitable supplemental protein source for sea bass (11)(AGRIS 1999-055242)(Naret, 1995). Shrimp meal was shown to be a satisfactory replacement for fish meal in the diets fed to tilapia with reducing growth (5)(CAB 981410062)(El-Sayed, 1998). Performance of tilapia was improved when shrimp meal replaced cassava leaf meal (10(AGRIS 97-136971)(Nieves, 1991).